So you got yourself a shiny new AR-15 for real cheap — maybe you bought a rifle kit like one of those from Palmetto State Armory selling for only $300 and you got a lower from Anderson Manufacturing for a dirt-cheap price of $40. 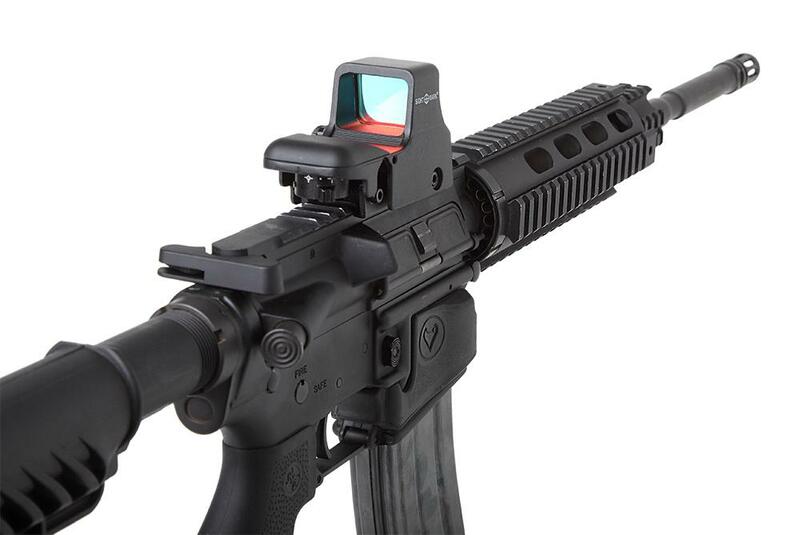 After putting your newly assembled AR-15 through its paces and breaking it in you decide that you want a cheap red dot sight. If you didn’t know, there’s a pretty good red dot sight that retails for less than $100 but is every bit as durable and reliable as more expensive red dot sights. Just as a quick disclaimer, this article is not intended for people who have all the money in the world to spend on the most expensive firearms and accessories they can get their hands on. If you’re looking for the best red dot sight your money can buy, we’d recommend the Trijicon MRO Patrol which we reviewed in this article last year. It is rugged, reliable and has all the bells and whistles — definitely one of the best red dot sights on the market today, but with its hefty price tag it will only appeal to people with the fattest wallets. If you’re looking for a mid-range type of deal you can consider the Vortex SPARC II which we also covered in another article. It boasts reliability and a near-indestructible construction with top-notch warranty at around half the price of the Trijicon MRO Patrol. However if you’re like me, the type who wants the most value for just about anything you’d spend your hard-earned buck on, you’re in the right place. Read on. 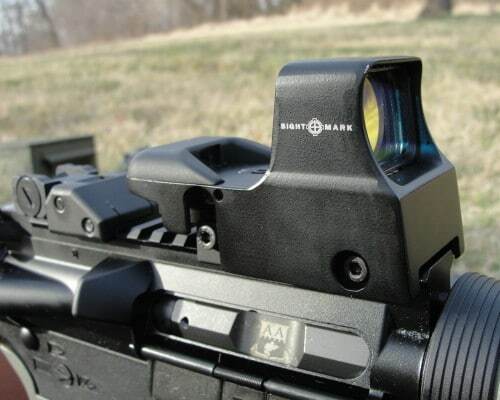 The Ultra Shot red dot sight is not the first product Sightmark has produced. Established in 2007, they’re fairly young as an optics company especially when compared to more common names in the field like Aimpoint and Trijicon. But they have several different red dots, reflex, rifle scopes, lasers and other optic accessories. Their Ultra Shot line of red dot sights alone has 19 different SKUs. 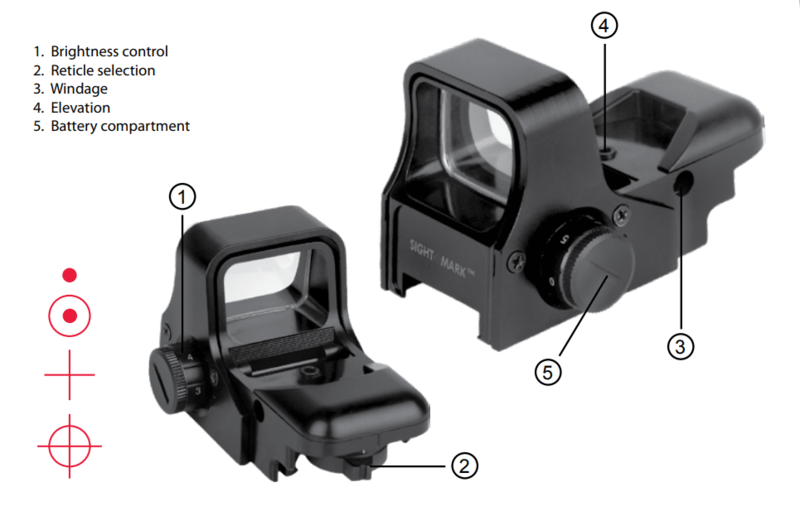 To avoid any possible confusion, “Ultra Shot” is composed of a whole line of red dot sight offerings from Sightmark. What we’re looking at today is the base model, Item# SM13005, which is the first in the Ultra Shot line of reflex red dot sights designed by Sightmark for shotguns and rifles. In 2011 Sightmark moved to a bigger headquarters in Mansfield, Texas, and they have been marketing their optics to over 40 countries around the world, so they’re no slouch in their field. Made of plastic reinforced with aluminum, the Ultra Shot base model’s housing measures 3.23 inches in length (82 millimeters), 1.81 inches in width (46 millimeters) and 2.24 inches in height (57 millimeters). For the price, the construction looks and feels surprisingly solid. It comes with an integrated mount compatible with both weaver and picatinny rail systems. Since it doesn’t come with risers like the Vortex SPARC II, the height of the glass window cannot be adjusted any higher than absolute co-witness. It has a beautiful matte black finish. It’s also notably lightweight, weighing in at only around 5.6 ounces. Make no mistake about it being lightweight though. It is robust enough to withstand recoil of the heaviest rifle and shotgun calibers. As specified in Sightmark’s website, the Ultra Shot base model is rated to withstand recoil forces of up to 1,500 G-force. To make sense of that G-force rating, a .50 BMG bullet fired out of a Barrett M107 bolt action rifle with a clamshell muzzle brake will typically subject a scope to 540 G-force in 0.6 milliseconds (rearward acceleration) and 500 G-force in 2.3 milliseconds forward (forward acceleration). Since AR-15s chambered for even the heaviest calibers (like the .50 Beowulf for instance) can’t touch the Barrett bolt action rifle’s recoil levels, the Ultra Shot shouldn’t have issues with recoil. In addition, Sightmark claims that the Ultra Shot base model works within temperatures of 0 to 120° Fahrenheit (-17 to 49° Celsius), but it can only be stored in temperatures of 14 to 140° Fahrenheit (-10 to 60° Celsius). It also has a water resistance rating of IPX4 — that is, it should hold up well against rain. Equipped with a relatively large window made of glass for acquiring targets that measure 33 x 24 millimeters (1.30 x 0.95 inches), the Ultra Shot is ideal for rapid firing and moving target shooting. It’s glass has a bluish tint to it, which is a little too blue for my taste but for the price I really can’t complain. At least it has infinite eye relief and at 100 meters, its field of view is 35 meters which is decent. 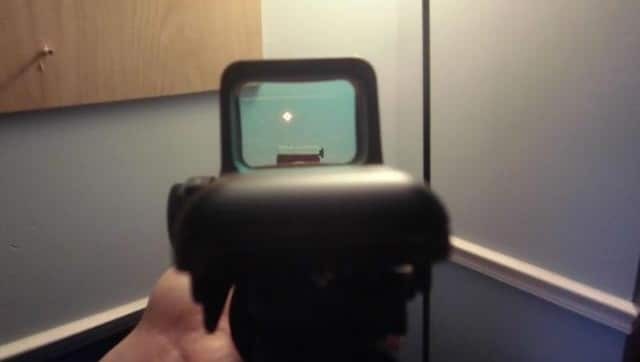 It is incapable of magnification beyond 1x which is standard in all brands of red dot sights that I’ve looked at so far, so no complaints there either. In addition, it is parallax-free after 10 yards and only up to 25 yards. While that may not sound enticing considering that the two more expensive red dot sights I’ve reviewed so far are completely parallax-free, realistically I don’t think I’ll ever shoot anything with an AR-15 using a red dot sight outside of a distance of 25 yards. If I’d go out hunting whitetail deer at up to 50 yards I wouldn’t even consider using an AR-15, caliber conversions notwithstanding — I would use a bolt-action .308 rifle equipped with a decent scope that has magnification. Like all red dot sights, all Ultra Shot red dot sights can be adjusted for both windage and elevation. The windage adjustment screw is on the left side of the housing while the elevation adjustment screw is on top, both have a range of adjustment of up to 50 MOA. Unfortunately, an allen wrench is required to turn these screws. Sightmark has them included in the box upon purchase, but if you prefer tool-less adjustment turrets, the Ultra Shot might not be the red dot sight for you. When adjusting, one click moves the point of impact 1 MOA. The windage adjustment screw turns counter clockwise, while the elevation adjustment screw turns clockwise. The clicks when adjusting the windage and elevation screws are crisp and highly audible, but the windage adjustment screw has been reported to be a tad bit more difficult to turn compared to the elevation adjustment screw. Once properly zeroed, it holds zero pretty much indefinitely unless the screws are re-adjusted. The Ultra Shot’s brightness intensity adjustment turret is also on the left side, with its brightness having five levels of adjustment. This screw also acts as the on/off switch. It uses a single CR1632 lithium battery, and the battery compartment’s cover can be unscrewed with no tools required. I personally find the 3-setting to be adequate and the 4-setting to be the brightest I would use in any bright daylight situation. The 5-setting is just way too bright for me, but it’s there if I’d ever need it. 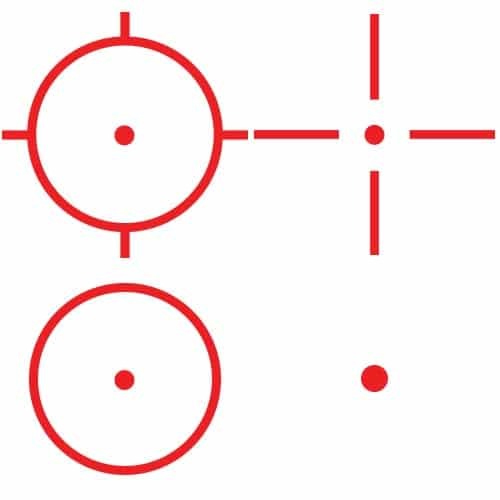 Unlike most other similar reflex sights on the market that only use a single type of reticle — just a red dot — the Ultra Shot has three different reticle patterns in addition: a circle with a dot inside, a crosshair-like pattern with a dot in the middle, and a combination of circle superimposed on crosshair with a dot in the middle. While some people might find the usefulness of these three additional patterns arguable at best to nothing more than just a marketing gimmick — practically useless at worst, I personally think having more than just one type of that boring old red dot pattern can come in handy in certain situations. For one, If I’m in a bright daylight situation and setting 4 on the brightness adjustment isn’t cutting it but setting 5 is just too bright, I could go with brightness setting 4 using the circle superimposed on a crosshair pattern. The adjustment knob to select any of the reticle patterns is seated horizontally in the bottom rear of the housing, and unlike the windage and elevation adjustment screws, this knob doesn’t require any tool and can be turned by the user’s thumb. As mentioned in the beginning of this article, the Ultra Shot base model can be had for less than $100 — it comes with an allen wrench for adjusting the windage and elevation screws, a piece of cloth for cleaning the glass window, and a neoprene cover to protect the optic. Sightmark’s website has them priced at $95.99, but if you know where to look, you might come across bargain-basement-type deals. In fact, you won’t have to look too far, just check out Amazon. There’s a huge lot of deals for these red dot sights. At the time of this writing, the base model SM13005 is selling for as cheap as $45, factory refurbished. The lowest priced NIB Ultra Shot is selling for $73.03 and if you have Amazon Prime, you won’t have to pay for shipping. In the event you’re reading this article a few months after it was published, you would probably find discounted brand new prices in the neighborhood of $75 to $85. As far as warranty, Sightmark offers a limited lifetime warranty. They also back their their products with a 14-day full refund warranty with no questions asked — as long as the purchase was made directly through their website. If warranty is a concern, look into any of the offerings from Vortex, like the SPARC II mentioned earlier. To help you decide whether or not the Ultra Shot would be a good buy, I’ve come up with a list of its pros and cons — at least those I think you should be aware of. The relatively big glass window allows for fast target acquisition. It’s surprisingly lightweight yet durable for its size. Unlike most other similar sight systems on the market that only have the standard red dot, it has three additional reticle patterns which is a total of four different reticles. It holds its zero pretty well even after repeated mounting and dismounting. It’s cheap, but not cheaply made. It has a limited lifetime warranty, but look at #3 below. The lens could use less of that bluish tint. The windage and elevation adjustment screws require an allen wrench to be turned. Aftermarket customer support is reportedly terrible, which effectively negates Pro#6. The resell value will be terrible considering the brand new price is already low. The integrated mount only allows for absolute co-witness height. If your AR-15 has a fixed front and rear sights and you prefer not to co-witness, you might have to purchase a foldable front and rear sights combo — either that, or learn to like absolute co-witness. Just looking at the list of pros and cons above, the Ultra Shot looks like a tough sell. Sure it’s cheap, but depending on your use case scenario and budget situation, the low price might turn you on or off. So let’s try to simplify the decision making. If you have a cheap AR-15 or you’re just looking to set up a ~$250 home defense rig (like maybe a Mossberg Maverick 88) and you want a utilitarian red dot sight, logically you wouldn’t buy one that costs around the same as (or more than) your gun. It would be downright silly. But what if you have a rifle or a shotgun that costs thousands of dollars and you intend to use it for everything including, but not limited to, home defense, hunting, 3-gun competitions etc.? Then you really owe it to yourself to outfit your piece with the best set of accessories you can get your hands on. The sky’s the limit when it comes to accessories for premium brands of rifles and shotguns. 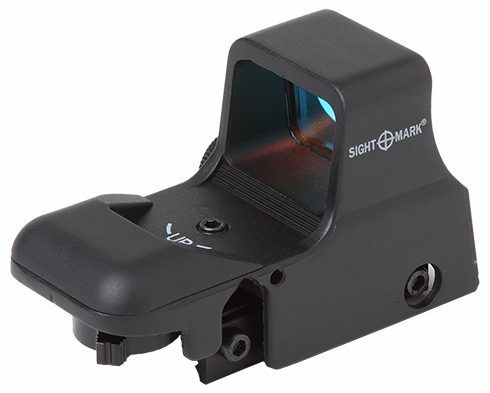 I’d recommend you look into the Vortex SPARC II or if you can afford it, the Trijicon MRO. All things considered, the Sightmark Ultra Shot base model is a solid contender in the sub-$100 civilian red dot sights market. It’s durable, reliable and will get the job done. But always remember that as with all things in life, you do get what you pay for. Thanks Jacques. Glad you liked it.